It was only the second time the Sharks and Roosters have met for finals football when they came together at Allianz Stadium on Saturday evening. The tryscoring started nice and early, off the first penalty of the night – a slow peel from Jared Waerea-Hargreaves – after which the Sharks chose to tap and go, in exactly the early statement of intent needed to win a match of finals football. 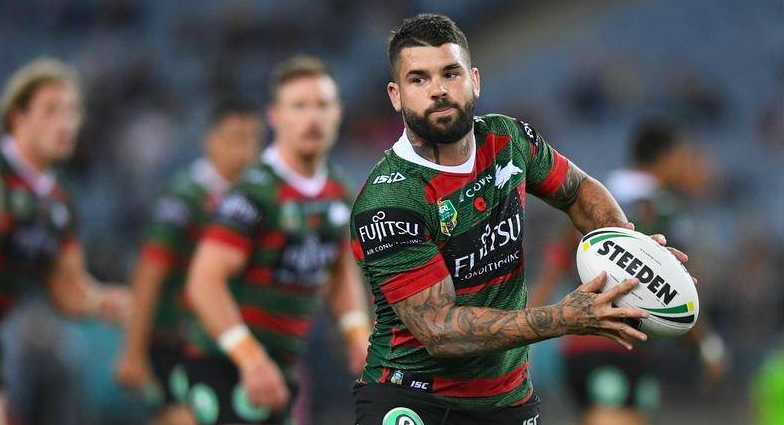 A clutch kick from Josh Dugan at the end of the set initially looked like a brainsnap, but it got Cronulla six again after a fortunate ricochet off Liu saw the visitors come up with the ball. From there, Wade Graham did what he does best, taking the short side and running right in to draw in the defence, before sending the Steeden across to Ricky Leutele for a catch-and-pass that utterly defied Blake Ferguson to contain it. As it turned out, Sosaia Feki had overrun his line slightly on the outside, but he was still able to slow down, catch the ball in one hand, remain in the field of play and the finally ground it in the corner, capping off a prodigious opening passage of play for the Sharks. With Valentine Holmes booting the ball away to the right of the posts, however, the scoreline remained set at 4-0, with the Roosters now receiving a pair of penalties to give them their own period of field position. Like the Sharks before them, the Chooks chose to tap and go each time, and while it might have taken a mass of Cronulla jerseys to keep Latrell Mitchell from crossing over, Feki cleaned up the high ball pretty neatly at the end of it all. Yet the Roosters weren’t finished, scoring on the next set what with amounted to a condensed version of Dugan’s earlier moment of inspiration, in one of the most sobering moments of the 2018 season for the Sharks. This time Cooper Cronk stepped into the spotlight, grubbering on the last for what initially looked like a slightly overweighted kick, only for the Steeden to ricochet off Graham and bounced back into the field of play. Seizing his opportunity, Cronk scooped the ball up once again and gathered it to his chest, careening through Holmes to plant it right beneath the posts, scattering Roosters and Sharks players in his wake. One of those players was Graham himself, who found himself collapsing beneath Liu, forcing his leg to bend backwards badly enough for him to leave the field for the remainder of the game. His role in the Sharks’ opening try was a reminder of how much he contributes to the team, while his injury in the 2016 finals season must have also been on the minds of the away crowd, as he went from enabling Cronk’s try to being the casualty of Cronk’s try. Some miscommunication between Tupou and Teddy under the high ball undid some of the Sydney City momentum, as the two backliners let the footy bounce, and Tupou made contact with his knuckles, despite pulling his hands right into his body as the ball launched itself towards him. An offside penalty for Mitchell a couple of tackles later allowed Holmes to clock up two more points to bring the scoreline to 6-6, as both sides ground in try to score the next try before the half time siren. At first, the Sharks seemed to have made it, executing a beautiful passage of play out to the left edge, only for Feki to just mistime the conclusion. While it was a terrific set piece, the absence of Graham couldn’t have been felt more concretely at this point, as Cronulla effectively repeated their initial tryscoring formation with the key try assister removed from the field. In retrospect, that was probably one of the key turning-points of the night for the visitors, although the Sharks did get another chance before they headed into the sheds. It started with a forward pass from Luke Keary, resulting in a scrum feed for Cronulla, during which Fergo bizarrely missed the scrum clock, forcing him to stay off the park until the Roosters got the football back. The Sharks now only had a twelve man team to contend with, but with Scott Sorensen losing the Steeden early in the tackle count, all their momentum came to nothing. An offside penalty for Leutele now piggybacked the Chooks back up their end of the field, while a second effort from Edrick Lee just as Cronk was getting set to kick was the writing on the wall. Sure enough, Joseph Manu crashed over a tackle later, reaching out a hand as Leutele was bringing him to ground to score four more. Full credit has to go to Tedesco, as well, who showcased some incredible speed to get over to Manu from the other side of the ruck, clearly galvanised by his first chance at finals football. He was everywhere throughout the night, and often seemed to have graduated into a new level of talent much as he had during his first Origin year – a player who was always destined to play finals relishing his first chance after years of first-grade excellence. 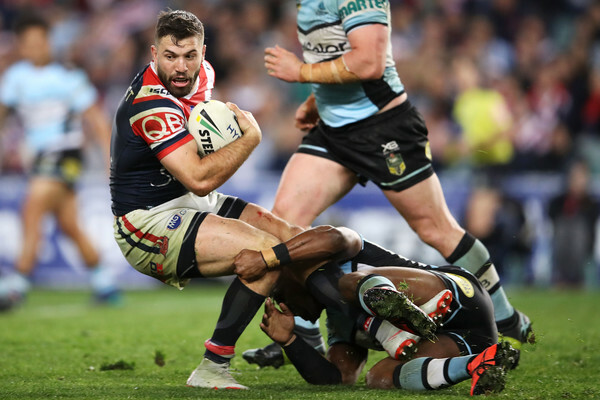 The Roosters’ resurgence was somewhat soured by a crusher tackle from Mitchell on Dugan three minutes into the second half. Whether it was the break, or the prospect of young Latrell being banned from the next week of football, the Sharks now consolidated immediately, with Holmes putting through an oblique grubber at the end of the next set that Teddy really had to scramble to clean up in goal. The next set ended with a grubber as well, but this time a try-assisting grubber, rather than a dropout-producing grubber, for one of the deftest and most efficient Cronulla set pieces of the night so far. It started with the Sharks appearing to be heading left, only for James Segeyaro to shift the direction of play as soon as it had started, flicking the footy back behind him to Chad Townsend, who read his intentions perfectly and sent through a skittering grubber to the right edge, where Lee was waiting for it. A brief contest between Lee and Tupou ensued, but the ex-Raider managed to keep in the field of play just long enough to get the chocolates, making up for the penalty that had set up Manu’s try just before half time. With the score levelled once again at 10-10, Holmes booted through the extras to put Cronulla ahead for the first time since the opening ten minutes of the match. As it turned out, however, these would be the last points scored by the visitors over the course of the evening, since the Roosters’ big playmakers now really stepped up over the back thirty minutes of the game. All night, Cronk had been achieving incredible kicks under pressure, and he booted through one of his best a couple of sets later, weighting the ball perfectly to find Tupou waiting on the Chooks’ left edge. Tupou now put in one of the most elegant aerial movements of 2018, outleaping the opposition to find the footy in the air and sending out a hand to tap it backwards for Mitchell to crash over for four more points. In slow motion, it looked even more balletic, since all logic would have seemed to dictate that Tupou would knock the football forward, only for him to twist and inflect his hand at just the right minute for it to find Mitchell on the chest. More like a volleyball move than a rugby league move, this was one of the most spectacular moments of the night, and yet it didn’t overshadow Mitchell’s putdown as much as it would have if the young centre hadn’t put in the crusher tackle earlier in this stanza. In light of that brainsnap, it was important for the home crowd to see Mitchell playing judiciously, and while some projectiles thrown onto the field seemed to distract him as he was lining up the conversion, this was still an important reminder of his power as a player if the team have to do without him for a game. A couple of sets later, the Chooks scored the last try of the night. There was nothing especially complex to it – just perfect, professional timing across to the left edge, in yet another reminder of what Cronulla could have done on their own left side had Graham not been led from the field so prematurely. The passage of play started with Cronk, who dummied and then came into the line, before sending the footy across to Keary, who hovered for the slightest of beats to get the Sharks even more interested. After those two preludes, Teddy stuck in the blade, capping off Cronk and Keary’s invitations to the Cronulla defence with one of the quickest catch-and-passes of the 2018 season – a catch-and-pass that seemed all the more rapid for the slight delay of the two passes that had preceded it. From there, it was inevitable that Tupou would cross over in the corner, for the first time in the evening when either side really felt as if they had a winning edge. An error from Moylan thirteen minutes out from the end said it all, after he coughed up the football following a fairly standard pass from Segeyaro. In a way, it was surprising that the Roosters didn’t manage to make the most of this to score again on the next set, although Mitchell put in a trysaving tackle that was as good as a try, wrapping himself around Luke Lewis as he crashed to ground, footy against his chest, eventually forcing the big Cronulla second rower to lose control just as he hit the turf. You could almost sense Mitchell desperate to make every effort he could before a possible ban, and this effort was every bit as big as his Origin hit-up earlier in the year, deflating all the Sharks’ momentum in an instant. On the next set, Cronk compounded that by stepping inside of Lewis to slow through the twenty-first field goal of his career, bringing the Chooks to a seven point lead. The final two points of the game also belonged to Mitchell, who slotted through a penalty goal four minutes out from the end after Aaron Woods was pinged for not being square at marker. Whatever happens to him next game, then, he’d more than reminded the team of his commitment this evening, while the Sharks have some serious thinking to do about how to reconfigure their approach without Graham as they prepare for another round of finals footy next week.